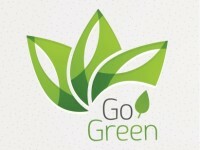 Going Green – What does it mean? — Buy things made from recycled materials. — Carry a reusable shopping bag. — Walk or ride bikes more than you ride in cars. — Turn off lights when you leave the room to save energy. — Make the switch to compact fluorescent light (CFL) bulbs. — Turn off the water when you brush your teeth to conserve water. — Bring your lunch to school in reusable containers instead of using plastic sandwich bags or baggies. — Keep your food scraps (banana peels, orange peels, potato peels, egg shells, etc.) out of the garbage. Instead, add them to your compost pile or bin.